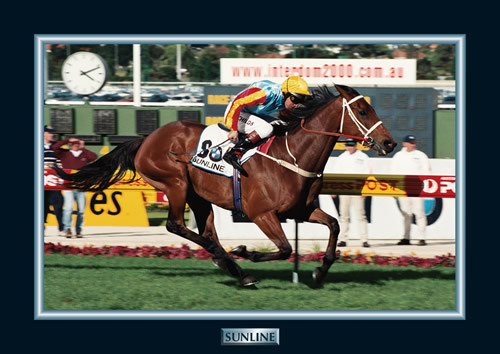 To suggest that Sunline in her time was the darling of the turf would be fair enough but there was little romance with the way she went about destroying her rivals. As Sunline went along breaking the heart of even it's most feared opponent she managed break many records along the way. Her relationship with Greg Childs was the modern-day relationship Moore had with Tulloch. It's easy to forget that she produced a Dulcify performance when she won her first Cox plate by a staggering seven lengths. Sky Heights and Tie The Knot were in a her wake on that day in 1999 and were considered anything but slouches. She won on all tracks in Sydney and in Melbourne but perhaps she will be best remembered for the invincibility that surrounded her when she stepped out at the Valley. The first time she raced there she won the 2040 Moonee Valley Oaks a listed race for fillies by over 5 lengths and from there on in never looked back. She won all the important ones including the 1999/02 Doncaster Handicap, 2000/02 Coolmore Classic, 2000 All Aged Stakes, and the wfa races like the Cox Plate with ease. One of the modern day immortals of the turf.